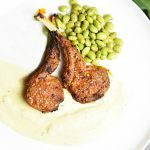 This recipe for homemade Grilled Lamb Chops is one of my weeknight specialities. Tender, juicy, lemony and spiced with an earthy mediterranean spice blend, they are bursting with flavor and simply delicious. Marinate: Lamb Chops In a medium bowl, combine all ingredients except lamb chops and mix well with a fork. Wipe dry, cut and lay flat all the chops on a platter/tray. Generously brush the marinade on all over the lamb chops coating all sides. Cover and keep aside for 15 minutes. Heat a wide skillet over medium-high heat (takes around 3-4 minutes). Use a grill pan if you want the grill marks. Place the chops in the pan. Cook 3 minutes each side for well done chops. Reduce to 2 minutes each side for medium rare done chops. Heat up grill. Grill chops for 3 minutes on each side (on a medium-high heat zone). Reduce to 2 minutes each side for medium rare done chops. Switch on broiler for a few minutes. Place chops on a lined baking sheet and pop it under the broiler, such that the meat is about 4 inches away from the heat. 3 minutes on each side for well done and 2 minutes for medium rare. Serve: Transfer the chops to a platter and rest for 5 minutes. Serve with lemon-saffron rice or warm pita bread and a greek salad. Ask your butcher to cut the rack of lamb into individual chops, or, using the bone as a guide- cut into 8 chops of around 3/4" thickness). The chili flakes and cayenne can be reduced or omitted to suit your spice preference.